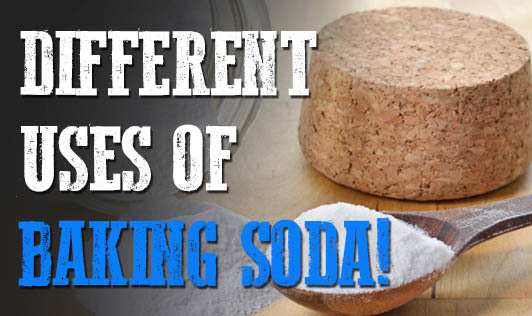 Different Uses of Baking Soda! 1. Wash fruits and vegetables: Soak your fresh fruits and vegetables in a tub of water with 1 teaspoon of baking soda to get rid of wax, pesticides and dirt. 2. For stove top cleaning: To get rid of burnt and blackened stains from your stove top, use baking soda with little water and scrub using a paper towel to get a sparkling surface. 3. To clean silver: Make a paste of baking soda with little water and rub this mixture on your silver jewellery. Rinse and pat dry. You'll be amazed to see your silver all clean and sparkly! 4. For fresh flowers: To keep flowers fresh in your vase, add a teaspoon of baking soda to vase water. 5. Cure Sore Throat: Add some baking soda to a cup of warm water and squeeze half a lemon. Gargle with this mixture to get relief from sore throat. 6. Mouth Wash: Put half teaspoon of baking soda in a cup of water and rinse your mouth. It helps reduce bacteria and eradicate odour. It works better than branded mouth wash.
7. To extinguish small fires: To put out small fires on clothing, rugs, upholstery and wood, sprinkle some baking soda. It is a good idea to keep a pack of baking soda in your car for emergencies. 8. For whitening Teeth: This is an age old trick to get clean teeth. Brush your teeth with freshly squeezed lemon juice to get sparkling white teeth! This can also be used to clean dentures. 9. First aid kit: A small pouch of baking soda in your first aid kit is a good inclusion. Paste of baking soda made with water treats insect bites and stings. 10. To clean and deodorize your fridge: Sprinkle some baking powder on a damp sponge and clean the inside of the fridge and smell the difference! So, get your baking soda out of the cupboard and keep it handy! You never know when you will need it!